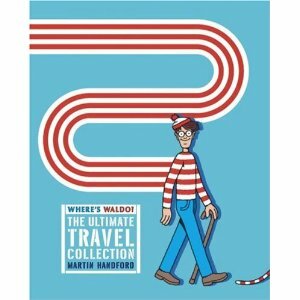 Book Review | Where’s Waldo? I remember how much fun I had looking through Where’s Waldo? when I was a child – I thought they were great fun and I used to spend hours trying to find Waldo and other items in the drawings. For that reason I was excited at the opportunity to revisit my childhood when I received Where’s Waldo? – The Ultimate Travel Collection by Martin Handford. I thought this book was fun (and tough!) because my eyes aren’t as young as they used to be and the paperback-size of the book makes the Waldos morph together at some points! There was also the challenge of having the items you are searching for at the beginning of each section (as a checklist) rather than having it appear on the page on which you are searching. That being said, I still loved it! I found Where’s Waldo? – The Ultimate Travel Collection to be addictive – once I started searching for different things on the pages I found it hard to stop until I found every element or my eyes got tired (or both)! And, just as I remember, as you are searching through the graphics on the hunt for various elements, you invariably find other quirky elements hidden on the page that made me smile! Where’s Waldo? – The Ultimate Travel Collection is a great book for kids but I think it’s also a fun book for adults!